The pottery of the era exhibits a high degree of artistry, a lure for looters today. The moundbuildersamong the first intensive farmers of the continent’s eastern woodlandsthrived because of what they called the Three Sisters–corn, beans, and squash. The population exploded between 800 and 1400 AD; towns and cities crowded the Mississippi and its tributaries. With survival’s burden lightened, arts and crafts blossomed. Interaction among communities became more formal and complex. Political systems and alliances arose, along with elaborate customs and religious rites. The social structure was that of the chiefdom; allied communities were governed by an elite whose positions were inherited or earned by outstanding accomplishments. The Southeastern Ceremonial Complex, also known as the Southern Cult, dominated peoples beliefs. Often symbolized in arts and crafts, the cult became more intricate as the culture evolved, with religion increasingly the means for rulers to assert authority. Civic and ceremonial mound centers grew more ambitious. Towns usually had anywhere from one to twenty flat-topped temple mounds, which served as platforms for temples or other important structures, such as the houses of the elite. Centers of power such as Cahokia in Illinoiswhere the most impressive earthworks were builthosted important festivals and ceremonies. The archeological evidence paints a picture of bustling centers, with houses of thatch and mud plaster stretching far among cultivated fields. 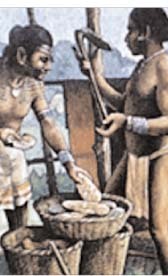 The rivers brought traders from afar, with not only basic items but luxury goods such as copper, mica, alligator teeth, and conch shells. Though rich soil may have been plentiful, people still competed for land, induced, perhaps, by their increasing numbers. War seems to have become a more frequent means of control as time went on. Villages were enclosed in wooden palisades; the study of artifacts shows an increase in martial symbolism. Signs of violence on human remains underscore this development. By about 1450 AD, the cultures had declined dramatically. Some hypothesize they may have been too successful. Competition for limited resources created tension, as did the class structure. Poor sanitation in the crowded river towns may have triggered epidemics. There is evidence of mass migrations, which points to widespread turmoil. By 1500, you could travel many miles in the once-populous valley before coming upon an occupied village. This is the world Europeans found. The shapes along the river were silent and overgrown, and centuries passed before newcomers knew of the epic that had unraveled before their arrival. 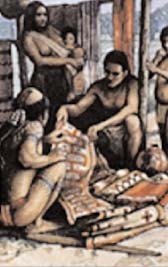 With the rivers as highways, trade was extensive.